It might not be 100% complete yet as I always have ideas how to possibly enhance or improve it but it is fully working as it is now. Please try it out. The biggest change from the previous version is in the UI where there is now more details available from the main window. The main window has been reworked to look more modern plus you don’t have to launch a separate(from the details window) editing window for a collector to edit its settings. The collector detail window has been enhanced so you can more easily see what the current and past state of a collector is/was. Then there is the reworked functionality around corrective scripts plus variable inheritance. Initially the plan was for to transfer all Version 4 functionality but a few features did not make it. Support for Windows XP has now been dropped (since .Net 4.5 is not supported on it). The BizTalk and Active Directory collectors has not yet been recreated (perhaps later one day…) since they rarely got used as far as I could tell. Also, the ‘details’ table view has been dropped for now since there is now so much other details available per collector. Well, don’t waste more time reading about it! Head over to the download and try it out! 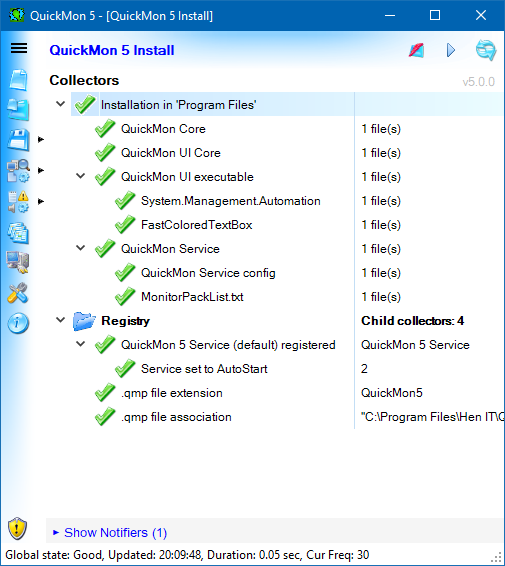 This is just a quick note to say that QuickMon 5 has reached Beta status. It is now mostly done with only some minor bug fixes and tweaks that needs left to be done. Most of the functionality of version 4 was copied over – with a few exceptions. More on that at a later stage. The biggest improvements are around the application GUI to make it easier to see details without drilling down too much.